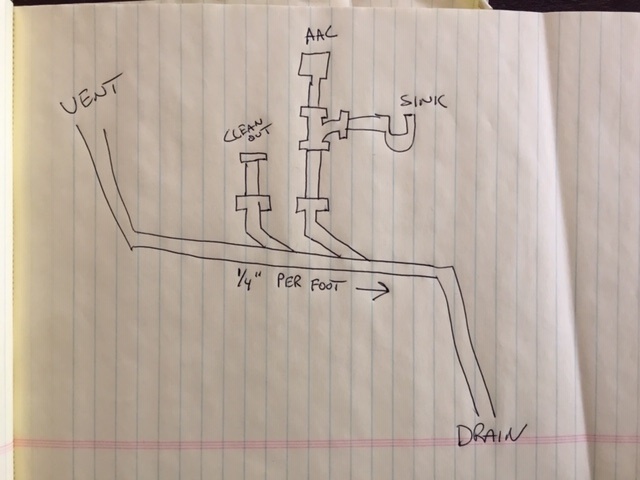 I have a question about an island sink drain, AAV's are legal where I am at and it is in the second story with a long drain, I don't like I can fit a loop vent. I have a wall close by that I can get a vent in , but it is just off the back of the drain line. Take a look at that drawing and tell me how stupid it looks, Ha ! Your not venting anything with the vent coming off off the back like you have it. Put the studor vent in and end it there. No reason to have a clean out either when all you need to do it take the p-trap off or if you just want a clean out put a 2â€� flush c/o tee on your line coming up before your 2x1-1/2 tee. out will become important at some point.